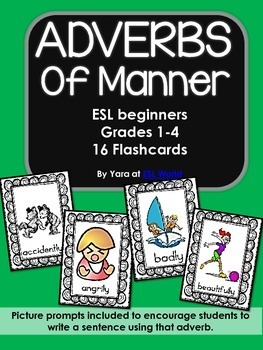 This file is a set of 16 flashcards for adverbs of manner which are taught to ESL learners. 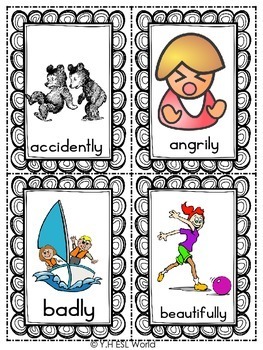 They can be used in many ways to practice using adverbs in sentences, games following instruction or simply as a review. 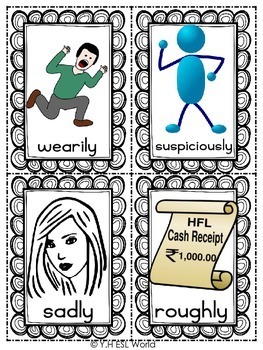 You can get students to write sentences using each card and share them as a whole class. 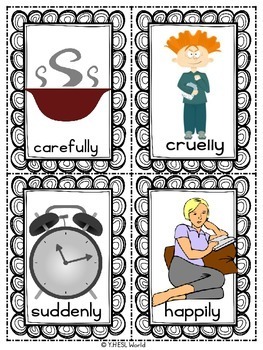 The pictures with each adverb displays an image which prompts a sentence, so students are encouraged to use that hint to write their sentences. They are very printer friendly, black and white and colored pictures. You can choose to print in grey-scale and the pictures will come out in black and white. Hope this set helps you out!